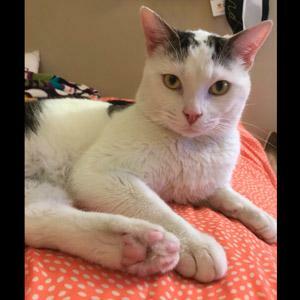 MYRRH is a very friendly boy who loves everyone he meets. He is very confident and settles into a new home right away. Myrrh is playful by day and a lover boy by night. Myrrh loves to play fetch with small toys or chase ribbons. He is also very curious and has a mischievous side, but he is also very loyal. He waits for you to return home and once you're home he doesn't want to leave your side. At night, all he wants to do is cuddle up and watch a movie with you or sleep by you at night. Myrrh is a talkative boy, but he also likes his quiet time looking out the window watching the birds. 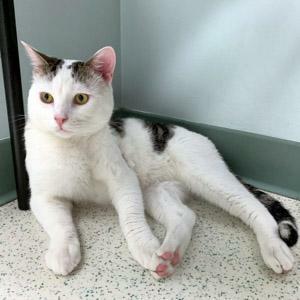 He is an amazing little guy who will make a lucky person or family an amazing companion. He needs a home where he will get plenty of love and affection. We haven't seen Myrrh interact with other cats in our care. However, he came into our care from a local shelter where he was co-existing nicely with two other young male cats in a room they shared. 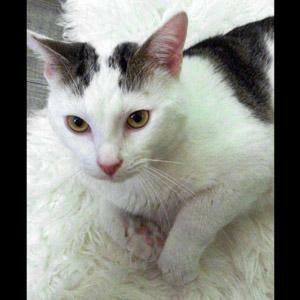 We think he would be very happy with a moderately playful male buddy.